Luckily, my management company’s design ineptitude has generated several teachable moments for me to share with you — my closest internet friends. If you want users to successfully interact with a process you’re building, your job as a designer is to reduce cognitive load to make the process as frictionless as possible. Case in point: my apartment’s trash disposal room. 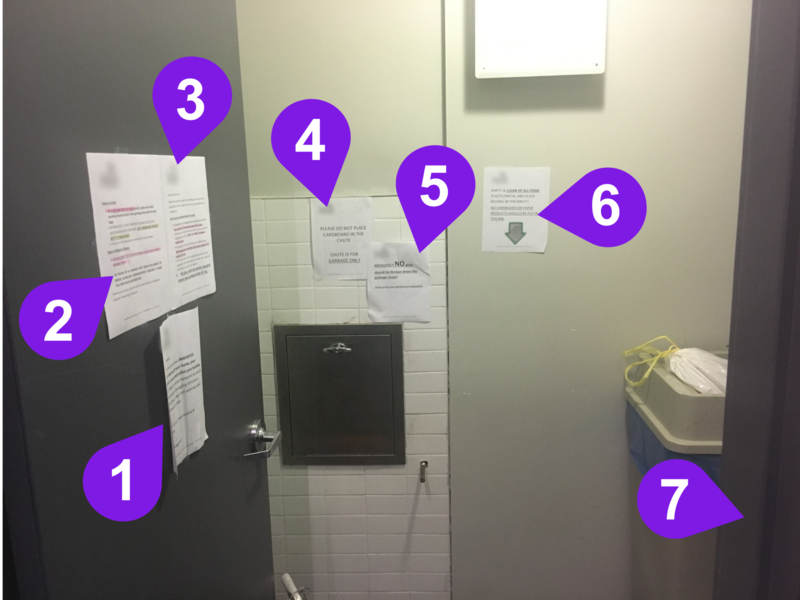 There are SEVEN SIGNS in this tiny room; each with multiple lines of complicated instructions. Giving detailed instructions to help us dispose of our trash more easily. 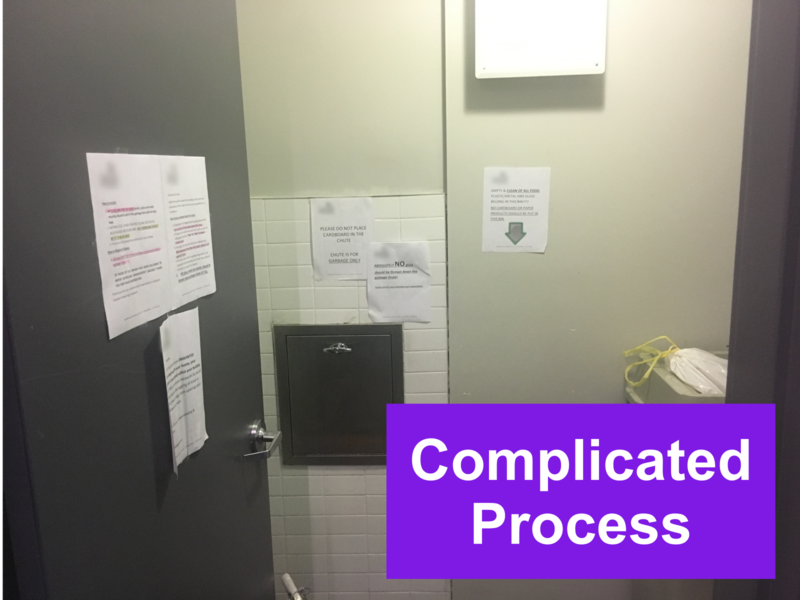 Making the process so difficult that I don’t read any of it (and just throw my trash and recycling where it makes most sense). Do their homework to make the process easier, and simplify the instructions like 100x. No one wants to read a novel to throw away their empty taco delivery packaging. When you want to get a point across, it’s a good practice to use design to guide the user to the most essential information. 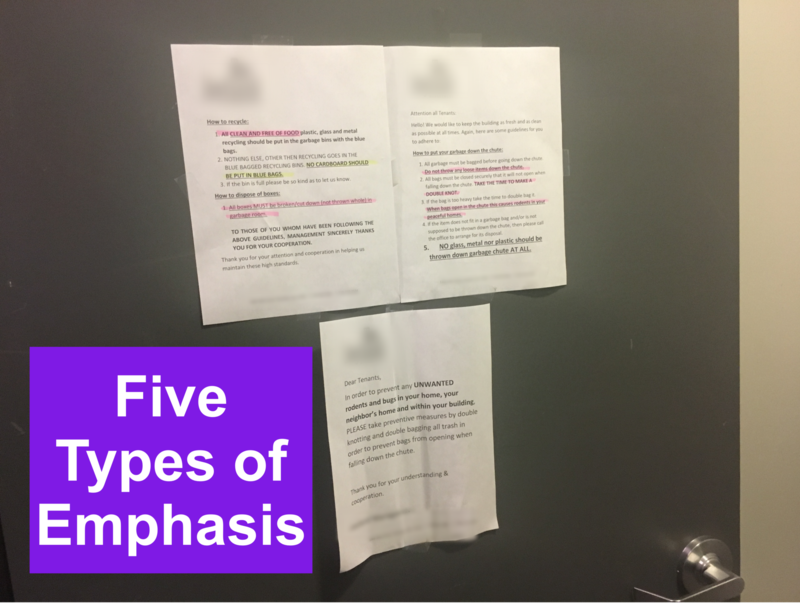 Emphasis is often a great strategy to do this — it can help users differentiate important text from supporting text. However, without discipline, emphasis can actually get in the way of guiding the user to the most important information. If, for example, you wanted to tackle the monumental task of actually reading the first three signs from the trash room, this is what you would find. Really, really making sure we read the trash instructions by adding capitalization, bold, underline, and two different colors of highlighter. Emphasizing so much on the page that essentially nothing is emphasized. It actually makes it appear more complicated and more difficult to understand. After simplfying their trash process to reduce cognitive load, replace the process communications with simpler versions. Use, at most, one type of emphasis and improve information hierarchy. Social Proof is a psychological and social phenomenon where people assume the actions of others in an attempt to reflect correct behavior in a given situation. In advertising, companies often use testimonials from other customers as a form of social proof. If other people have used this product and achieved their desired results, I (as a prospective customer) probably will too. In my apartment, however, social proof has an unexpected consequence that actually undermines the message they’re trying to get across. Other people in the apartment are smoking and getting away with it. 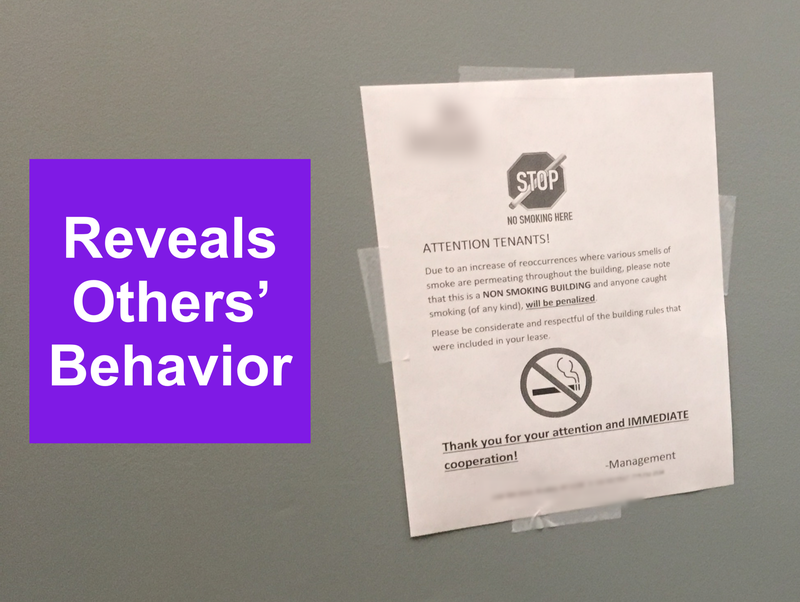 Instead, appeal to the number of other people who aren’t smoking in the apartment — position the message so the smokers feel they’re the only ones. Thirdly, appeal to the impact smoking has on other tenants to reinforce the social impact of continuing to smoke in the apartment. User interface conventions are design patterns that users expect from a given interaction. Whenever users have established an expectation of how to perform a certain action (i.e., I can return to the home page by clicking the company logo on the top left of a webpage), don’t diverge from that expectation without good reason. In some cases, this effect is so strong that the context of user interface conventions actually overshadows the content of the message. I direct your attention to my apartment’s laundry room. Since I’ve lived in this building, people have prioritized the machines on the left of this photo. 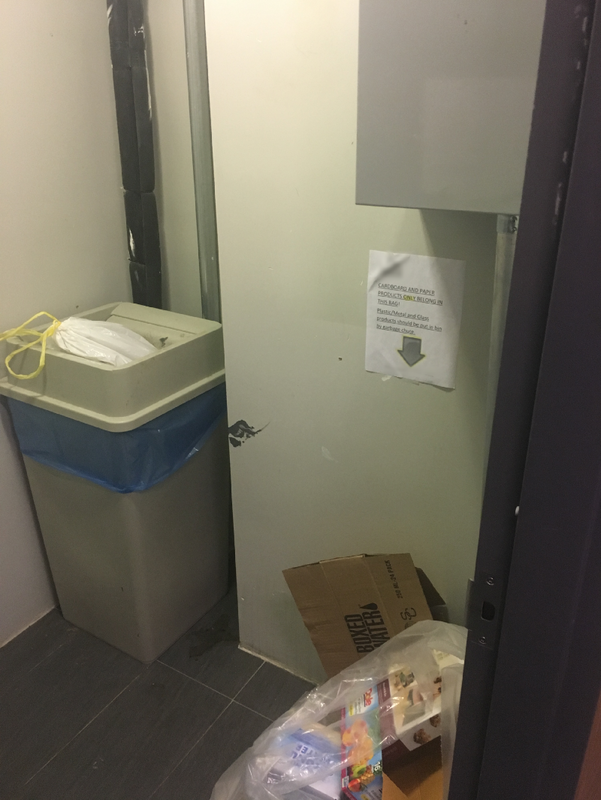 They’re the closest to the door, closest to the trash (for dryer lint), and the first machines people see when they enter the laundry room. However, I came to the laundry room recently to find the machines on the left conspicuously empty, in favor of the machines on the right. Question: What would drive people to change their behavior from using the most-convenient machine to using a slightly-less-convenient machine? Some BS about hounding us to bring the laundry carts back. Don’t even bother to read the sign, this machine is out of order. First, lighten up about the laundry carts or get more. Jeez. 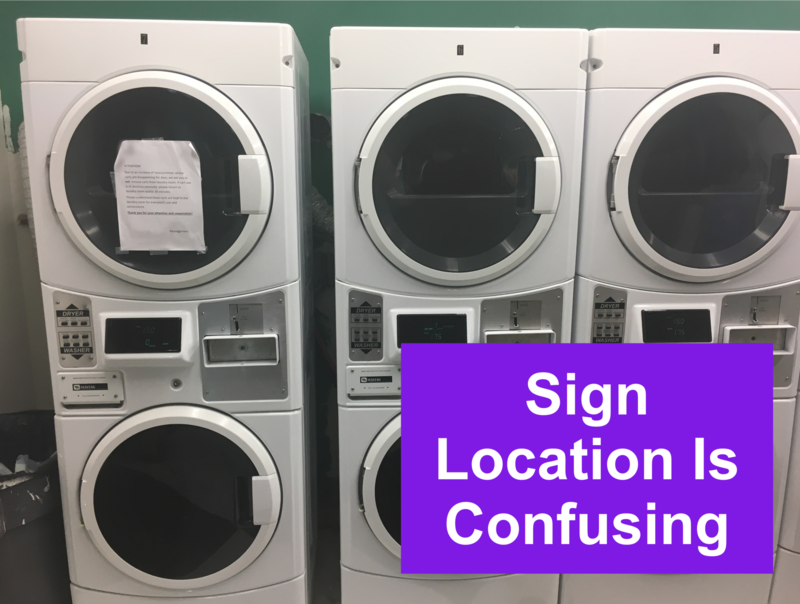 Second, put the sign on the door, or near the laundry carts, but not on the machines. Any time you’re in a situation where you’re communicating a message, pay attention to these principles to help you empathize with the user’s experience. Also, the people who run my apartment are actually very nice.